Wiggins, when he was a guard with my beloved Houston Rockets. As Canadian basketball phenom Andrew Wiggins moved through his first year in professional basketball and beyond, he will likely be confronted with all the pressures and temptations being a superstar brings. However, he will have to look no further than his own father to see what making the wrong choices can lead to. Let’s hope the sins of the father are not visited upon the son. 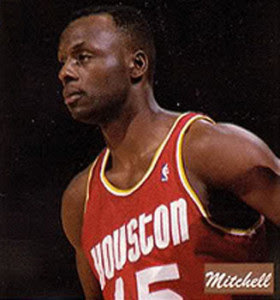 Mitchell Wiggins was a solid first-round NBA draft pick himself in 1983, taken by Indiana but moving to Chicago for his rookie season, then landing with my own beloved Houston Rockets in the 1984 off-season. I recall the 1986 season when the Rockets, led by the twin towers of Ralph Samson and Hakeem Olajuwon, advanced all the way to the NBA finals before falling to Larry Bird and his powerhouse Boston Celtics. The future looked bright for the Rockets. It was a year later when I heard the news. Houston’s entire back court was banned – not suspended – banned from the NBA for drug violations. It was 1987 and their two guards were gone – Lewis Lloyd and Mitchell Wiggins. I could not believe it. The loss hurt the Rockets who would not make it back to the finals for eight years. It also began an odyssey of discovery for Mitchell Wiggins that led to redemption, hope, and a chance to make amends through his children. The ban would last at least two years. After that Lloyd and Wiggins could apply for reinstatement. In the meantime, Wiggins still had to hit rock bottom. According to a 1989 story in the Orlando Sentinel, he went to the Continental Basketball Association but, after playing 15 games, failed another drug test and was suspended. He went to Europe but no team wanted him. Eventually, he realized he had an addiction to cocaine. With some professional help, he and his wife designed their own plan for him to regain control. Pretty soon he was sending the NBA results of the drug tests he took twice a week, even before the league asked. His wife also played a pivotal role in his comeback. In addition to support and designing that plan to regain control of his life, Marita Payne-Wiggins insisted they train together during his suspension. They were relentless. In addition to sprinting, he did weights, basketball, cycling, rowing, swimming and thousands of pushups. He also kept in shape by playing in the United States Basketball League and Continental Basketball Association. Wiggins was eventually reinstated for the 1989-1990 season, where he had his best season in the NBA. By the time he was reinstated he was clean and sober for almost two years. However, he was released and did not catch on with an NBA team until he suited up for the Philadelphia 76ers in the 1991-1992 season. It was back to the CBA then bouncing all over Europe and back to the States until he retired in 2003. After retirement he coached for the next few years. His greatest gift to basketball would still be coming though. Marita Payne-Wiggins was much more than the supportive wife of a disgraced professional basketball player. She was a two-time Olympic silver medalist with the Canadian track team. In 1984, she was part of the women’s four-by-100-metre relay team that took silver in Los Angeles, and part of the women’s four-by-400-metre relay team that also won silver. She is the co-Canadian record holder in the 400 metres and the legal Canadian record holder in the 200 metres. Payne-Wiggins also had a stellar career at Florida State University where she met Mitchell Wiggins, a two-year starter on the Seminoles basketball team. Since 2002, they have made their home in Vaughn, Ontario. In the 2014 NBA draft, the Cleveland Cavaliers made history by drafting freshman phenom Andrew Wiggins first overall out of Kansas University. It was the second straight year the Cavaliers took a Canadian with the top pick, selecting Anthony Bennett from UNLV with the number-one overall pick in the 2013 draft. The Cavaliers would trade the two Canadians to Minnesota in a deal to get Kevin Love. There, Andrew Wiggins, who had drawn some early criticism, excelled and at season’s end was named NBA rookie of the year. Andrew followed in the footsteps of his older brothers Mitchell Junior, who played at Southeastern University, and Nick, who played at Wichita State University. Both were then identified by the Harlem Globe Trotters. After the NBA draft, all the top picks were required to attend a series of sessions spanning a few weeks to discuss what their new life as professional basketball players will look like. There was information on financial planning, relationships, and of course substance use and abuse. I distinctly recall seeing an interview with Andrew Wiggins. They asked him what he thought of the sessions. He responded, matter of factly, he had heard these messages from an early age and understood the pitfalls ahead. The sins of the father will likely not be visited on the son.